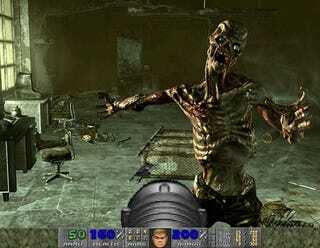 Doom, Fallout, Oblivion, Wolfenstein, Carmack, Howard... all in one company. Two of the most acclaimed game development studios of all time are joining forces. ZeniMax Media, parent company of Fallout 3 and Elder Scrolls development studio Bethesda Softworks, announced today that it is purchasing legendary Doom and Wolfenstein studio id. In an interview with Kotaku, id co-founder John Carmack, id CEO Todd Hollenshead and ZeniMax CEO Robert Altman said the purchase will change none of the principles or principals of id and Bethesda but will allow id to grow like it never has before. The purchase does not affect plans for previously announced games from id that are slated for release through other publishers, including the Activision-backed Wolfenstein and the EA Partners-planned Rage. "We're really getting kind of tired competing with our own publishers in terms of how our titles will be featured," Carmack said. "And we've really gotten more IPs than we've been able to take advantage of. And working with other companies hasn't been working out as spectacularly as it could. So the idea of actually becoming a publisher and merging Bethesda and ZeniMax on there [is ideal.] It would be hard to imagine a more complementary relationship. They are triple A, top-of-the-line in what they do in the RPGs. And they have no overlap with all the things we do in the FPSes." Hollenshead said ZeniMax's acquisition will allow id to grow its internal teams, staffing up the groups working on the next Doom — which will now be a ZeniMax game — and the Quake Live team, for starters. The goal, explained Carmack, is for id to handle all of its own IPs. "We can build the pipeline and have a regular pipeline of releases." Altman described the deal as a "win for fans of id." He said the deal came about when Hollenshead approached him. ZeniMax had been looking to acquire developers and wanted id, but didn't know it was available until approached. The merger had been in the works for months, according to the men on the call today. In a press release for today's news, Altman laid out a vision for a robust id: "We, along with many others, consider id Software to be among the finest game studios in the world, with extraordinary design, artistic and technical capabilities. They have demonstrated, repeatedly, that rare ability to create franchise properties that are critical and commercial successes. Our intention is to make sure id Software will continue to do what they do best – make AAA games. Our role will be to provide publisher support through Bethesda Softworks and give id Software the resources it needs to grow and expand." No co-developed games are planned at this time. But, they joked, getting those Fallout bobbleheads into Rage would be fun.